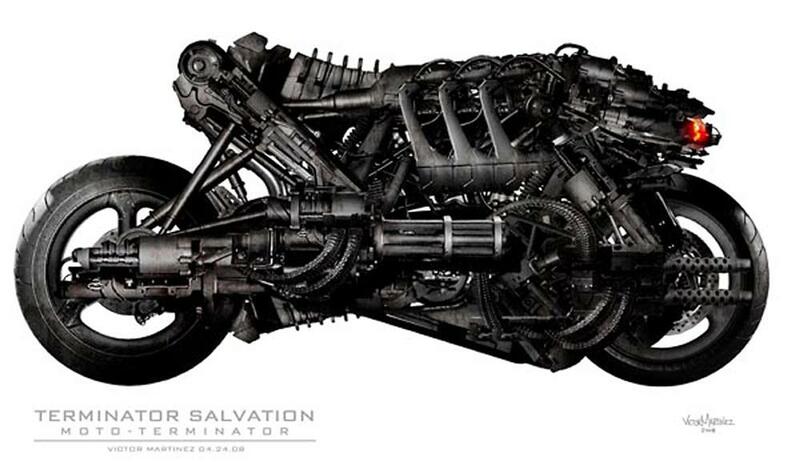 Even killer motorcycles can’t save Terminator Salvation. The fourth Terminator film is the first set after machines have taken over the world, when terminators run amok. There are flying ones, swimming ones, giant ones – and motorbike ones. The Moto-Terminators are intelligent rider-less bikes with guns mounted either side and glowing red eyes instead of headlights. They feature in the most spectacular action sequence of a movie packed with spectacular action sequences. They were filmed using real Ducati Hypermotards which were digitally altered beyond recognition. As a result their movements are satisfyingly realistic, although being machines they can manage a few special tricks like righting themselves in the middle of a low-side as they pursue Marcus Wright, played by Sam Worthington. Christian Bale, who plays resistance leader John Connor, flew into a rage with a crew member during filming. It’s now clear why he may have been in a bad mood. He’s not the star of Terminator Salvation; Worthington is. His character’s story, the unanswered questions about what he is, and in particular the sequence in which he’s pursued by the Moto-Terminators, are the best this film has to offer. Whether he’s supposed to be more likeable than Bale is debatable. Certainly the audience is supposed to warm to him. It seems unlikely Bale was intended to inspire such apathy. Indifference towards Connor, and the fact the questions about Wright are answered too soon, mean that, despite all the action, there’s little to care about in the second half, a situation not helped by an over-complicated and annoying plot. Bikes have two more outings, once when Wright does a Great Escape-style jump on a motocrosser and once when Connor hijacks a Moto-Terminator and rides it (Note to machines: When building killer motorbike robots, don’t give them handlebars). More relief comes from a convincing CGI version of Arnold Schwarzenegger’s original terminator, with no impairment of acting ability. But even he can’t save the day when you don’t care if the hero lives or dies. The salvation of the tired Terminator franchise this is not. Terminator Salvation is released today.